Another calamity has befell the US. 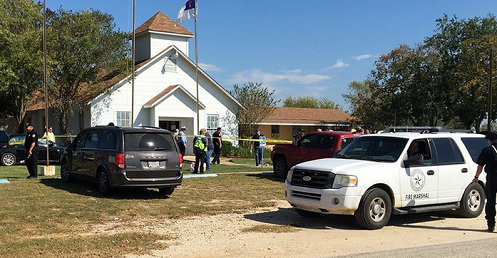 More than 20 people were killed after a gunman walked into a church in a tiny rural community about 30 miles east of San Antonio today. Albert Gamez Jr., another Wilson County commissioner, told CNN that he was told by the police that the gunman was chased into the next county and was killed, but it was not clear whether the police shot him or he killed himself. Mr. Gamez said he was told by an emergency medical technician that 27 people were dead and 24 others were injured. He said the victims were still inside the church. Sutherland Springs is a small community where everyone knows one another, he said. The unincorporated community has a population that numbers in the low hundreds — the 2000 census was 362, according to the Texas State Historical Association. The preliminary death toll would amount to about 7 percent of the population.